I had been waiting for the right day to wear my new Simply Be ribbed knitted dress. It is a short sleeve dress, so I was waiting for a winter day that was not too wintry. The weather forecast looked good for Tuesday, so I decided to go to the mall for a little shopping and a little eating. My femulation began at 9 AM and by 10:30, I was ready to go in my new Simply Be dress, new Payless white kitten heel booties, new Jessica Simpson bag and my relatively new hairdo. I arrived at the mall at 11 AM and it was so warm outdoors (65℉) that I left my overcoat in my car. I entered through the Macy's entrance, browsed the their dress racks, but nothing interested me enough to try on. I proceeded into the mall and window-shopped until I arrived at Ann Taylor. I find their clothing attractive, but the last time I entered their store (over 25 pounds ago), everything I tried on was too small. I was hoping to be more successful now that I was a little lighter. 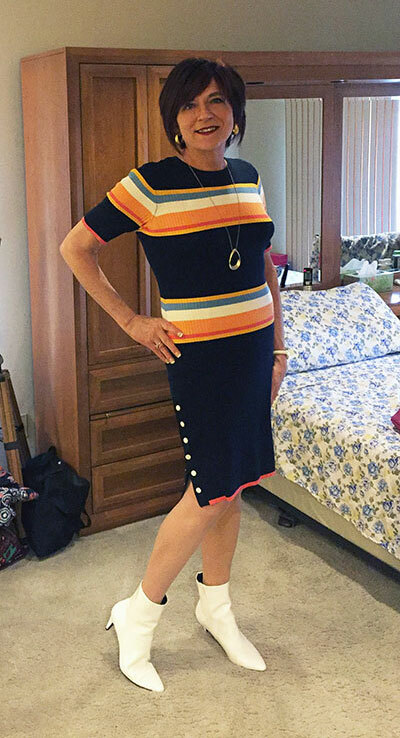 As I entered the store, a sales representative greeted me and said that she loved the colorful stripes of the dress I was wearing. Her remark made me wonder why I was bothering to shop for another dress! Carlos Marco femulates Soraya Arnelas on Spain's version of television's Your Face Sounds Familiar. Clearly, you were shopping for another dress because you can. Wow, Stana, you look gorgeous in that dress! The booties are cute, even if they aren't my style. And you are there to shop for more, even if the SA loves your shopping outfit!